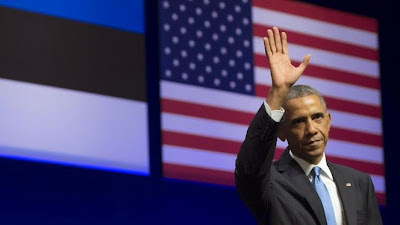 TALLINN, Estonia -- President Obama's speech on Wednesday in Estonia, a small eastern European country that reasonably fears it could be next on Russia's invasion list, was a huge step against Russian aggression. President Obama speaks in the Estonian capital of Tallinn. Obama promised that the US and the other members of NATO (a military alliance that includes most of Europe) would fight to defend any invaded member state, including Estonia, as if it were "Berlin [or] Paris [or] London." That is a big deal, meant to deter Russian aggression with the ultimate threat: war against the United States military. But there was another message in Obama's speech, one that was in the subtext but came through loud and clear, especially to Ukrainians: the United States and NATO will not defend Ukraine from the ongoing Russian invasion pushing across its border. The US is not exactly abandoning Ukraine — it still wants to help — but it is not going to do anything that would force the Russian invasion to stop. The Obama White House is no stranger to the Ukrainian capital of Kiev, which Vice President Joe Biden visited in a show of support in April, shortly after Russia had invaded and annexed Crimea. So Obama clearly could have gone there for this speech, which he announced in response to Russia's mid-August invasion of eastern Ukraine. But he didn't, and that's significant. Obama's choice to go to a NATO country and assert that the US will defend other NATO countries, at a moment when Russia is invading a non-NATO country, made it pretty clear that the US is not going to turn back Russia's tanks in Ukraine — or, perhaps, in any other non-NATO country, such as Moldova, where Putin is supporting breakaway separatists, or Georgia, where Russia fought a war in 2008. This does not mean that the US and Europe are indifferent to Ukraine's plight. They have sanctioned Russia's economy repeatedly and heavily, sending it to the precipice of recession. They have isolated Russia politically, for example by booting it from the G8. But these sanctions are about punishing Russia to deter it from future invasions, or at best an attempt to convince Putin that invading Ukraine is not worthwhile. But Putin's actions have demonstrated very clearly that he is willing to bear Western economic sanctions for his Ukraine invasion, and the US is not escalating further, so the invasion continues. The US is taking some tougher steps in Ukraine, but they are not very much. Obama, in his speech, called for "concrete commitments" to help Ukraine modernize its military, but it's not clear what he meant, and even if Ukraine were armed to the teeth it would still lose any open war with Russia, which has the second-largest military in the world. So building up the Ukrainian military, while a nice symbolic gesture, will not stop Putin. The US is also sending 200 troops to participate in NATO military exercises later this month that is taking place, very conspicuously, in western Ukraine. Putin wouldn't dare strike near the NATO forces and risk war. But it turns out that the exercises are being held on the complete other end of Ukraine from the fighting, 750 miles from the front lines, along the border with Poland, where there is near zero imminent risk of Russian invasion. President Obama has set a big, bright, clear red line for Russia's military adventurism: the member-states of the North Atlantic Treaty Organization. The country's inside of that line, he insisted, can count on US military support, and that is a big deal. But the countries outside of it, from eastern European states such as Ukraine and Georgia to Central Asian former Soviet republics such as Kazakhstan, are largely on their own.